Our mission is for Corby to be at the forefront of meeting two of the UK’s key challenges – a lack of quality new homes and ever rising energy costs for residents and businesses. 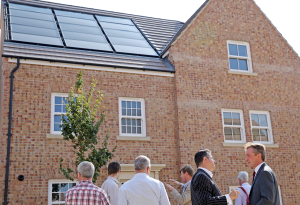 In 2013 we delivered our first Zero Energy Bill Homes, a project supported by SEMLEP, to develop a series of new homes on Priors Hall Park that looked like traditional semi-detached houses. With substantially improved insulation and complete with renewable energy generation and home automation we guaranteed no energy bills for the first 2 years of occupation. We have now begun our second housing project, taking the Zero Energy Bill target a step further towards a vision for Energy Positive Buildings – that is, homes and commercial buildings that not only achieve a net zero energy bill but have the potential to be net exporters of energy, either to the community or the grid. To deliver this ambition, Electric Corby CIC first established a new consortium of leading edge partners to develop the concept based on learning for ZEB 1 and the integration of energy storage. Our concept has attracted public sector support through the grant of Horizon 2020 (CHESS-SETUP) funds from the EU Commission and we have now formed, with partners, a special delivery company to attract the additional private investment needed to make this commercial project happen. Glendale EcoHomes has secured planning permission for 47 new homes and development is due to start on site in early 2018. The first homes will be ready for occupation in late summer 2018. This is the shape of the future… be part of it in Corby!